Mural, commissioned for new-build project in Aylsham. Max Height 10m, covers 3 walls in cafe/lounge entrance area. 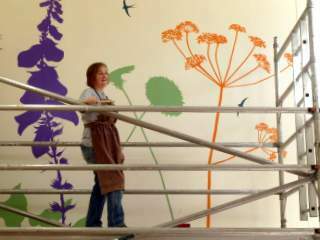 This indoor mural was commissioned for the new communal living Housing with Care development in Aylsham Norfolk. Designed to be contemporary and fresh, and to lead the eye up into the 10m high ceiling space, by using the silhouettes of outsize wild meadow flowers (plantain, foxglove, dandelion, cow-parsley and shepherds purse), along with flying swallows swooping between. Commissioned by Wherry Housing, and Circle Group. Jessica also accepts commissions for village signs and pub signs: two recent examples include the outdoor signs for Aylsham, Potter Heigham, and Spixworth.